Sick and tired of stress, emotional eating, overeating and diets that don’t work? It’s about mastering one simple secret of mindful eating so that you can enjoy your food, feel calm and confident that you are achieving your health goals like you have always wanted! You are just about to discover the power of mindful eating and change your relationship with food! When you understand and accept your true hunger, when you realize the psychological, emotional, behavioral, physical and even spiritual causes behind your stress and overeating, only then can you can start to take holistically mindful steps to remedy it. Embrace the power of mindfulness and self-love and start a new, balanced chapter of your life you deserve. This is what this book is designed to help you with. Within less than an hour you will be equipped with super practical mindfulness and mindful eating strategies that will accompany you on your journey to better health and a peaceful lifestyle! Invest in your health and wellbeing. Order your copy now and unlock the power of mindful eating to leave mindless habits behind forever! 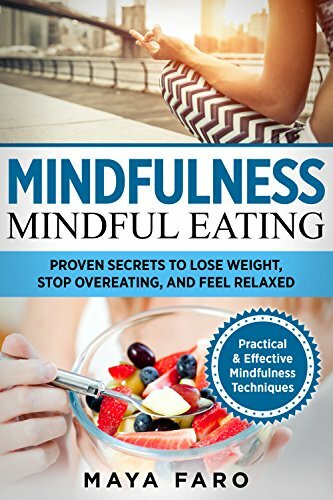 This is the Kindle version of Mindfulness: Mindful Eating: Proven Secrets to Lose Weight, Stop Overeating and Feel Relaxed (Mindfulness, Weight Loss, Anxiety, Binge Eating Book 1) that you can also download and read on your computer and mobile phone. Kindle books are DRM protected and therefore, unlike ebooks that are in PDF or ePUB format, you cannot read this ebook without the official Kindle apps.